So you're thinking - wait... you're a singer! What equipment could you possibly need so that you can get out on stage and sing? The expenses for an opera singer are constant and quite significant – completely out of proportion to what we earn and completely unsubsidized! One significant cost is technology used in our promotion, our music making and even our learning. In today’s musical world, we are now expected to have full control over the skills and technology for self-promotion as well as the tools that many would consider in a skilled hobby not even related to singing. A whole library of sheet music at your disposal. Recommended: Samsung Galaxy Note, iPad Pro or any similar tablets that have a customised stylus. Originally, when I wrote this article, this was not on the list. But for several years now I have owned a tablet and now it has been the most essential part of my musical equipment - which is why I have updated this article five years later to reflect this! I use a Samsung Galaxy Note 10.1 (2014) Tablet and have a library of complete opera scores, arias, songs, libretti, song texts, concert repertoire lists, audio/video recordings and even equipment packing lists at my fingertips. Everywhere I travel, I am able to learn new music and e-mail or to print out copies of arias for pianists if need be. I avoid using printed music as much as I can. Not only is it starting to take up a significant amount of space in my filing cabinet, but it became a pain to take an extra five kilograms of scores and music every time I travelled. The only reason that I photocopy or print sheet music at all is to give to a pianist. If I need to play some simple melodies or warm-up on the go, I have a piano keyboard application (Piano for You) in my tablet and in my phone. For more details, see my article Going digital with sheet music. 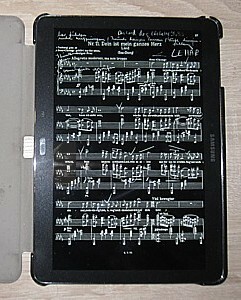 König and Meyer M 100/1 Music Stand. This seems absurdly obvious, but this is something that, strangely enough, took me many years to invest in - which looking back was pretty silly. This is why I'm mentioning this piece of equipment first, in case it's also a revelation for somebody else! As a singer learning music I used to do silly things like propping my music on top of the dining table or even sitting down to learn music or even practice. 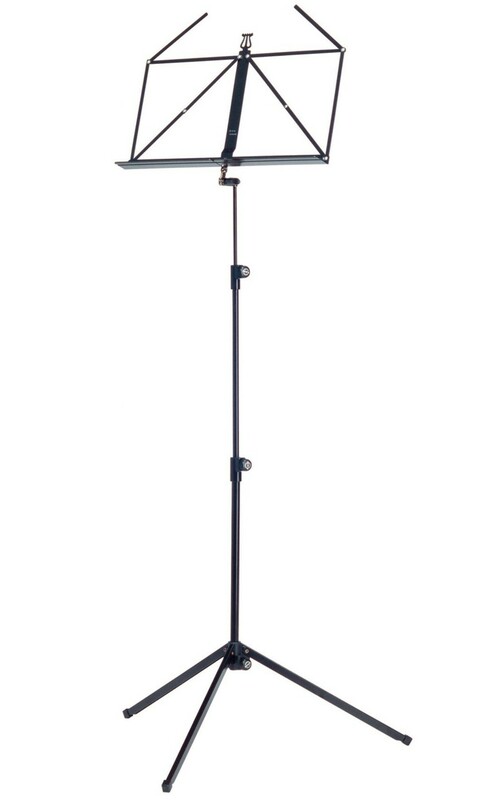 However, the benefits of a proper music stand are that you can adjust it to a proper height so you stand normally and can practice without holding music. When you are holding the music, you are not thinking about what you are doing with your body or with your hands, which is very important for your character in your singing. I find it takes effort to even hold a score up to a good height (which can be a couple of kilos) and puts strain on my arms and back after only a few minutes. That can cause tension to slip into your practice. Sometimes, due to having to hold a score for an hour, I had an unconscious tendency to sit down at my desk to practice instead of standing, which is not a good habit to get into if you want to do some real singing. My stand of choice, since I am not only an opera singer, but a performing singer/songwriter, is the König and Meyer M 100/1 Music Stand. I bought this particular one because it folds into a very small, and easily transportable, shape with it’s own carry bag. Also, because it’s made of steel, it’s not as flimsy as some of the cheaper nickel music stands, which would continually fall over on me (and even bend) under the weight of heavier scores. Spend the extra cash – trust me! Recommended: iPod Video (outdated), Sandisk Clip Sport or any MP3 player with mechanical controls and lots of storage space! As a singer, I find you need your recordings with you at all times! On the train, in a queue, basically anytime you are idly waiting means you can be working. 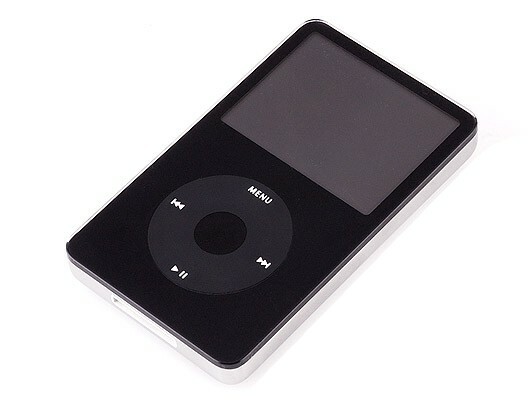 I use an iPod Video (unfortunately now "obsolete" and almost impossible to buy) because of its huge storage capacity, long battery life and its mechanical controls, which is head and shoulders above competitors. I find iTunes is also the easiest and best MP3 organisation program I have found. One great advantage for singers using iTunes/iPods, if you are learning roles you can organize all the relevant tracks into playlists, saving you so much time than constantly finding the tracks on your CD player. However, the iPod Video has now disappeared from the market. My recommendation would be the Sandisk Clip Sport because of the mechanical controls and the fact you can increase the storage with a Micro-SDHC Memory Card - at time of writing you can buy 128GB cards which would provide more storage space than any other player on the market. Of course, you CAN use your phone, but it drains the battery pretty quickly, it's much slower to access the songs than a dedicated device and you have to stop the music (and the application) every time you get a text message or when the phone rings! Compact device with an awesome microphone and controls build in. Not an iPod recorder. Not a tape recorder. Not a phone. When you have singing lessons, coachings, whatever... you should record them, not only to remember what was said but to listen to yourself objectively outside of your body. And also to take notes afterwards when you have a second chance to really process what is being said and what you hear. For many years, I was using an iPod recorder, my mobile phone and before that… tapes. These are all make-shift devices and the quality of the recordings reflect that. They are muffled, noisy, unadaptable and either too quiet or too prone to distorting if they weren't at exactly the right distance away. When your teacher's speaking voice is so soft and your singing voice is distortion, it's bloody annoying and painful to listen to and often I would not even bother as a result. Not to mention that these devices were completely unreliable and prone to crashing (tapes being the exception) resulting in loss of the recording. Buying a quality, dedicated recording device means that you are getting a good quality and reliable recording device designed precisely for this use. Plus, if it is digital you can store it on your iPod and on your computer, which makes back-ups, making copies and editing very easy! Let's face it, if you spend $2000 a year on singing lessons, you should spend a couple of hundred dollars on a good recording device that will get you more out of your lessons. Plus, when you need a really quick, pain-free option to record a concert, you have have something capable of doing a fantastic job. 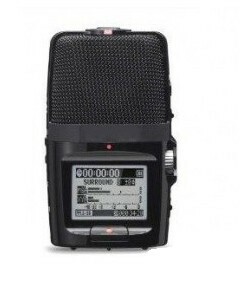 At time of writing in 2013, I heard the recording quality of one of my operetta concerts (orchestra and singers) using a ZOOM H2N digital recorder (currently priced at $218AUD), which is aimed at being a portable music recording device. I was blown away. The recording quality is outstanding - it could have been released professionally! This is the device I use now for lessons and sometimes to record live performances. It's aimed at musicians and sound technicians, which you can tell because there is a really flexible gain control for the recording levels of the microphones, which is my biggest gripe with most of the dictaphones on the market. There are also 4 microphones built in - two at the front and two at the back. You can select which microphones are active and using all 4 microphones allows you to record in 360 degree surround sound. Recording front and back is a really simple way to produce a piano and vocal recording and be able to mix the two instruments together. iPod Recorders - makeshift devices, not great microphones, unreliable and prone to crashing. Mobile Phones - bad microphones most of the time. Tape recorders - reliable, but not best sound quality. Any dictaphones which are marketed as dictaphones instead of music recorders. I used to use the Olympus WS-813 Digital Voice Recorder, which despite having very good quality microphones, it didn't really adapt well to live recordings. The main reason is that the recording functionality (noise reduction) built-in are designed for speech and for people who don't know anything about sound. The microphone on the lowest settings are turned up really loud to pick up human voices at low volume - great for recording interviews and meetings. It has compression built in, so the sound never distorts, but because the microphone is sensitive, even on the lowest setting - it means you don't get accuracy and a wide range of dynamics. Canon Powershot SX620 HS attached to a micro-tripod. A great camera for its price! 5. 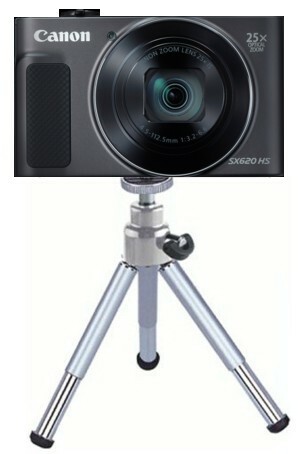 Video recording devices - Camcorder and/or Digital camera and Tripods. 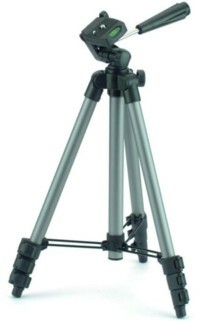 Cullmann Primax 180 Camera Tripod. Unfortunately, many major singing competition and agents want video recordings of your auditions before they will even hearing you live. It’s a tremendous advantage to buy a high-quality digital camcorder, but if you can’t afford one, then a 150€ camera can do a record Full-HD videos. Obviously combining the video with the superior sound quality of your recording device (listed above) is what you should be aiming for. The downside: editing video and audio together really requires some know-how and software. Don’t forget the tripod – it’s worth getting both a large tripod (pictured right), as well as a smaller micropod for recording from table-tops (pictured left) in case you find yourself in a room with very little space. The camera I currently use is the Canon Powershot SX600 HS. Obviously, it won't compare to a quality camcorder, but for its size, it takes great photos and records in full HD video. When you’re stuck for microphones or for time to edit, the sound recording quality is actually pretty good. 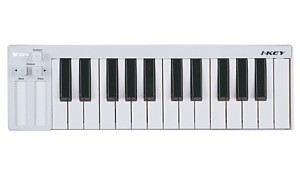 Cheap, reliable and compact 25-key MIDI keyboard. If you are a very good sight-reader, you can get by without one, but it is much faster to learn repertoire if you can play the melodies, other vocal parts and some of the accompaniment. Once I started learning Lulu, which is a 12-tone opera by Alban Berg, I actually broke down to buy a small one as I was finding it next to impossible to learn this piece without it. Obviously, nothing beats a piano, but if you don’t have the money or the space, you can pick up a midi keyboard very cheaply. I use the ICON I-KEY Keyboard, which is a very small, very cheap (less than $100) midi keyboard. The downside is that it has no speakers or built-in sounds in and this means you need to plug it into your computer to play it. It plugs into the USB port of your computer and it's fits on my desktop (it's 32cm long) and it packs away into my desk drawer. Download Virtual Midi Piano Keyboard and you’re set to go. M-Audio Fast Track Ultra USB sound card. When recording for agents, opera houses and competitions, you would be crazy not to have a studio quality demo. The problem is, you have to update it all the time! Owning the equipment and doing it yourself can cut down your costs significantly. Coming from a background in rock bands, I have learnt over the last twenty years to do this quite well, but once again, like cutting videos it takes a bit of technical know-how to record, edit and cut a demo. Entry level recording microphone, but worth much more than it's price tag! I use RØde NT-1a microphones (Australian-made... yay! 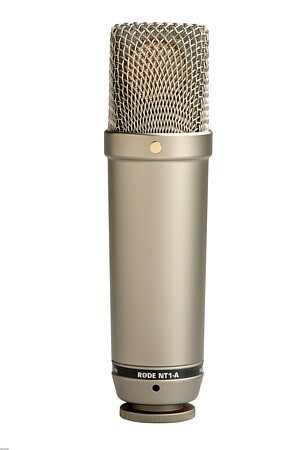 ), which are entry level condenser microphones, but of which I have absolutely no complaints. They reproduce sound accurately and are the quietest microphones I’ve ever used - meaning you don't hear any buzz of static or hissing from the microphones that you would hear on old tape recordings (or with regular vocal dynamic microphones) for instance. If you would like to hear the quality of these sound recordings, here is an example of a live recording and a close-miked recording. You need an external USB soundcard to power the condenser microphones and also to do multi-track live recordings - meaning each instrument/voice is split over seperate tracks so you can mix the volumes of the two together. I use an M-Audio Fast Track Ultra with four inputs - which is no longer on the market. The current equivalent is M-Audio M-Track Quad which you can plug four microphones into at once. These three programs are the ones I use after many years of research. You can do pretty much everything just with Audacity as a classical singer and it's a simple software to simply edit your singing lessons. I tend to use Reaper and Sound Forge, because I do a lot of private studio recordings and a lot of editing and these programs simply have the effects (eg. particular types of reverb) that I am looking for in these situations. Software I will never use again: Cubase and Pro-Tools. Both are unreliable and both caused sonic flaws. In the case of Cubase, I used it for five or six years thinking that this was a computer problem until I went and bought Reaper. I have a personal gripe with Pro-Tools. The first couple of times I used it, it crashed my computer, forcing me to reboot. The third time this happened, I realised it was when I unplugged a microphone. The recordings I made were flawed and full of static pops. I spent many hours scouring the user forums and optimising my computer to try fix the problem (some of it required very advanced computing knowledge), but it never really worked. It’s anti-piracy USB lock sometimes didn't work properly. It ruined a recording session while I was on location. Not only did it crash when I unplugged a microphone (forgetting at the time that it was going crash my computer), afterwards the program refused to re-start afterwards as it no longer recognised its anti-piracy USB Key was plugged in. Not to mention if you lose the key, you can't use the program you've paid for. I had to abandon using my good microphones and record with the camera and I wasted valuable time messing around. Thank god I wasn't recording somebody else! Video editing is a very new concept to me, but now the digital technology is available in a do-it-yourself way (like sound recording is as well), a lot of agents and competitions are demanding it as a pre-requisite before any live singing.  I found this area a mine-field, with a huge amount of rubbish software that caused me more pain than results. If you want to do some something fancy like cut more than one video together (for example, using multiple camera footage), or easily replace the audio from your camera with what you recorded on your condenser microphones, the first piece of software that has actually produced good results for me was Sony's Vegas Movie Studio Platinum. It is very easy to import several videos, stick them together and replacing the audio track is very easy. It's also relatively cheap! Commercial software that has failed for me were Cyberlink Powerdirector and Windows Live Movie Maker. Although I could successfully edit and cut videos - in both cases, every edit seemed to drop the quality of the the film significantly. Or the soundtrack inexplicably disappeared. Or a very common video format was not supported. Maybe I had never figured these programs properly, but I certainly put in an inordinate amount of time trying - so they are probably not worth the effort! Samsung Galaxy Note 10.1 Tablet (2014). ZOOM H2N portable digital recorder. Pronto De Luxe Micropod (crank). ICON I-KEY USB Midi Keyboard. M-Audio Fast Track Ultra USB Soundcard (2 microphone or 4 microphone). 2 x 10m Microphone Cables. Virtual Midi Piano Keyboard - Free software to drive your midi keyboard. Audacity - Free sound and multi-tracking recording software. Reaper Digital Audio Workstation - Professional multi-tracking software. Sony Sound Forge - WAV/MP3 editor. Sony Vegas Movie Studio Platinum - Professional Movie Editing. Freemake Video Converter - Free movie editing and conversion software.